What are Conventional Loans and Conforming Loans? By definition, a Conventional Loan is any mortgage that’s not guaranteed or insured by the federal government. 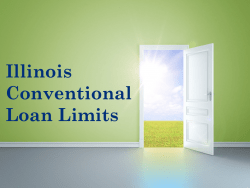 Illinois conventional loans may be either “conforming” and “non-conforming”, although ‘conventional loans’ generally refer to ‘conforming loans’. Therefore Illinois conventional loan limits are the same thing as Illinois conforming loan limits. Maximum LTV Ratio: The maximum financing loan-to-value ratio for conventional mortgages is 80% – 97% of the appraised value of the home or its selling price, whichever is lower. Learn how to calculate loan-to-value. Maximum Loan Amount: Conventional loan limits in Illinois are set at the floor amount of $424,100 across the entire state. Metro areas in IL with a conforming limit of $424,100 include Chicago, Aurora, Rockford, Joliet, Peoria and Champaign. Illinois conforming limits can change anytime. Check back often to ensure accuracy. 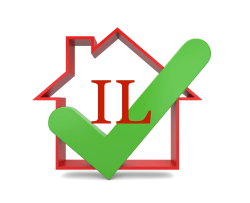 What factors determine if i’m eligible for a Conventional Loan in Illinois? Conventional conforming loans follow the terms and conditions set forth by government sponsored enterprises (GSE’s) like Fannie Mae or Freddie Mac. To be eligible for a Conforming Loan in Illinois, your monthly housing costs (mortgage principal and interest, property taxes, and insurance) must meet a specified percentage of your gross monthly income. Your credit background will be considered. A FICO credit score of 620 or above is generally required to obtain a conventional loan approval. You must also have enough income to pay your housing costs plus all additional monthly debt. Conventional home loans require the home buyer to invest between 3% and 20% of the sales price towards the down payment and closing costs. If the sales price is $100,000 for example, the mortgage applicant must invest at least $3,000 – $20,000 to meet conventional mortgage down payment requirements, depending on the program. What property types are allowed for Conventional Conforming Mortgages? warrantable condos, planned unit developments, modular homes, manufactured homes, and 1-4 family residences. Conventional loans can be used to finance primary residences, second homes and investment property. Learn more about conventional mortgages. What types of mortgage and refinance programs do Conventional Loans offer in Illinois? Conventional Purchase Loans – Conventional loans offer a variety of programs for applicants with good credit ratings to buy a home. Both 3% down mortgage and 5% down mortgage options are available, however 20% down is the minimum amount required to avoid private mortgage insurance. Conventional Rate/Term Refinance: Conventional Rate/Term refinancing loans are for borrowers who currently have an FHA, VA, USDA or conventional fixed rate mortgage or ARM loan and wish to refinance into a conventional mortgage with a lower interest rate. If you’re a homeowners considering a stable, conventional fixed-rate mortgage, this program may also eliminate your mortgage insurance if you have at 20% equity in your home. If not, Conventional 97% loan programs may also work for you. Cash-Out Refinance: A Conventional Cash Out Refinance is perfect for the homeowner who wants to access the equity that they have built up in their home. This program is beneficial to homeowners whose property has increased in value since it was purchased. What factors determine if I am eligible for a Conventional Refinance Loan? To meet conventional refinance mortgage requirements in Illinois, your monthly housing costs (mortgage principal and interest, property taxes, and insurance) must meet a specified percentage of your gross monthly income. Your credit background will be considered. You must be able to cover closing costs and have enough income to pay your monthly debt. PMI Insurance – What is PMI? Is Subprime Making a Comeback?